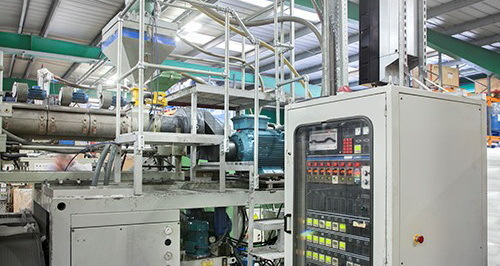 Installing an ABB motor and drive to an ageing blow moulding machine has provided an astonishing turnaround in performance and savings. These included a 30% increase in usable product and a 60 % fall in energy costs for the machine. PrimePac Limited in Northern Ireland, specialises in continuous extrusion blow moulding. It manufactures a range of plastic bottles, containers and jars together with closures, pumps, sprays and various accessories. A 23-year-old plastic bottle blow moulding machine used a hydraulic motor to run the extruder. The machine ran 24 hours a day, five days a week. Its motor was operating inefficiently and suffered poor speed holding properties, resulting in a poorly formed bottles. It was also not delivering the expected level of output: it had been taking ten seconds to create a bottle, but over time, this had increased to twelve. The extruder was also creating long tails of excess plastic requiring reworking. The machines energy use was compared against an existing all-electric model. This proved that when making bottles of the same size and weight the old machine consumed significantly more energy. Its power use was also erratic, and consumption was high due to the hydraulic pack requiring extra torque on start up. Faced with a quote of £34,000 to refurbish the machine, PrimePac decided on a more radical solution. They decided to install an ABB synchronous reluctance motor (SynRM) and an ACS880 drive. The ABB motor and drive combination would reduce electricity use, improve speed holding and improve the product quality. Due to its location near the process, the ACS880-01 drive was ordered with IP55 enclosure. Following the installation, logged data revealed a 60 percent energy saving giving a payback period of under 12 months. The ABB motor and drive use its direct torque control (DTC) to accurately control speed-holding on the drive. It is now much more accurate, leading to a consistent length and weight of plastic through the extruder and into the mould. This means less wastage – no more long tails – as there is no product overspill. Previously, only 63 percent of extrusions became bottles, due to the erratic and sporadic movement of the machine. Following the upgrade, this increased to 96%, with the remaining 4 percent occurring when the machine is ramping down. Less waste reduced recycling costs, saving a further 5 percent of energy. Other benefits included a significant reduction in noise and vibration from the machine.